It all started with a browse on the internet. I've been building "out of the box" models for some years now and have never built anything like this before. I saw several photos of some replica props that people have done in the past so I thought that I would give it a go. I have always been displeased with MPC's Y-Wing.. so tiny, sooo blah. So this was the project! STEP 1 COLLECT YOUR RESOURCES. It's important that you collect as many photos of the ILM model as you can. There are tons of pictures out there. I used "From Star Wars to Indy" and "Star Wars Chronicles" for most of my research. Examine the ship from every angle - front, top, sides and back. Try to determine its basic shape as that's what you will need to build first. Worry about the "greeblies" and "guts on the outside" later. STEP 2 BLUE PRINTS/BATTLE PLANS. A good project starts with a good plan. At this time I didn't know anyone who could help me with exact plans of the studio model so I used the blueprints in the "Chronicle" book . I enlarged them on a standard copy machine until I achieved the scale I wanted - roughly 1:48. With plans in hand and a roughed out parts list I headed to the model store. I decided to use balsa wood for the front sections as it is easier to work with that styrene and is more forgiving. I had to buy several sheets of styrene plastic, all of different widths, along with various size rods and tubes (Evergreen got lots of my money!). I purchased extra balsa to laminate and make the domes on the engine pods (which were "Estes" model rocket bodies). In all I spent about $90. STEP 3 GETTING STARTED. I decided to begin by building the front section and cockpit. I laminated three pieces of block balsa together and let dry. I then traced the shape of the front section from the blue prints onto the top and sides of the balsa. I used a jewelers saw to cut the shape from the block. Next, sanded the front section to shape (referring to the photos often) using coarse sandpaper. Once the front section looked right I used a balsa sealer to give the wood a smooth appearance. I traced the cockpit outline from the blue prints and used my trusty Dremel motor tool to hollow out the inside of the balsa front. I used the same technique to build the canopy with 4 sections of styrene. The dual gun turret on top was made by attaching two bomb rack assemblies together from a 1:48 A- 10 kit ; the guns were made by gluing two shock absorber coverings side-by-side. Next, I took two different sizes of styrene rod (smaller into the larger) and attached them to the shock absorbers. These were then mounted on a hub assembly from a pick-up truck model. Now it was time to build up the body of the ship. I used three different size planks of sheet balsa to achieve a recessed appearance in the middle of the body. 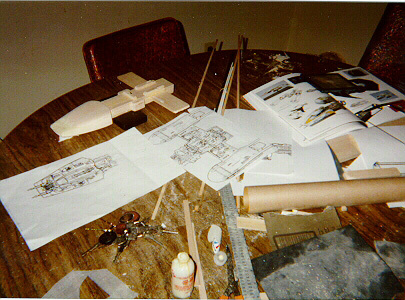 I traced the blue prints directly onto the balsa, then cut out the basic shape, including the engine support struts. All the parts were glued together, sanded (and sanded, and sanded) and sealed. Using the blue prints I also cut two matching sections of model rocket tubing. Finally, I placed cut out slits in the sides and attached to the engine support struts. STEP 4 ENGINE DOMES. If you can get your hands on old L'eggs pantyhose containers and two Airfix Saturn V kits (discontinued, and at least $33 a piece!) you can build up the engines as ILM did. The cheaper - and just as effective method - is to make the parts yourself. To save you the heart ache of laminating balsa and sanding it down to the dome shape go ahead and order 3" Hemispheres from Plastistruct for about $1.50 each (hey you learn as you go! ) (you can also find plastic domes of the appropriate shapes in many craft stores - Ed). Once you get the hemispheres in glue them to the fronts of the engine pods. sheet styrene in various thicknesses. First, I cut and separated the A-10 engines and set them aside. I traced the engine support structures to styrene, then scribe dand separated for each engine. I glueg them to the engine body first. When the joint set up I then glued them into the rear of the engine tube section. Using a straight rule I made guide lines on the engine body for the "T" rod vector supports, once again refering to the drawings and reference material for placement. The vectors were cut from the section of coke bottle near the top where the bottle begins to curve inward shape. I cut to match the diameter of the engine tube - with a little luck you'll get it the first couple tries. Next I removed the plastic cap ring left on the tip of the opening and sand off the rough edges. Then cut this in half to get 2 rings - presto: that's your circle detail for the vectors. I cut and drilled out the details on the vectors to match my blueprints. There are both vertical and horizontal details. Be careful when handling these small parts and they could break after drilling. Also there is some added detail and scribed lines that need to be added to the outer vector when it's attached to the supports. STEP 6 DETAILING THE EXTERIOR AND COCKPIT. This will probably take you the longest time to complete. Get out your spares box and junk kits because it's kit-bashing time. First make sure your Y-Wing has clean edges. Give it a quick coat of primer to show imperfections, then fill and sand as needed. You will need to add a basic under-structure (paneling) to your ship. I used styrene 'plates' with scribed surface detail and little strips of styrene attached (a hundred little bits, might I add!). I also used direct mold casting. I pressed parts I wanted to duplicate into molders clay and used coated the resulting mold "PAM" cooking spray as a release agent (messy, but it works). I poured 2 part epoxy for most of the skin detailing. I also used Alumilite for parts requiring more detail. I started from underneath and built up layer after layer of detail. An important NOTE* remember do not add "greeblies" - bits and pieces - at random! Check your references. Every part on a starship has a purpose - make it look that way !! I used parts from many different kits - everything from car engines to airplanes, and even from the smaller X -Wing. 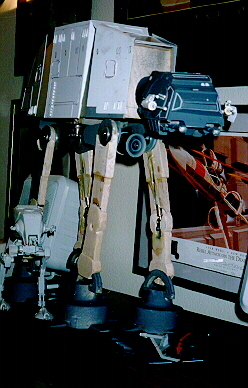 I found this to be the funnest part of building the model I took a look back at photos of ILM craftsmen building the kits for Star Wars and saw myself in the same pose doing the same thing. Make sure you left room for you know who... your trusty R2 unit. Refer to your blueprint for placement. Once again I sanded and sealed balsa, then added styrene details and scribed lines to make a fine R2 unit. I built up the cockpit next, starting with a basic styrene tub. This I painted Flat Black. I bought an after- market 1:48 scale MiG-29 ejector seat and detail set and went to work. With some cutting and sanding - and the addition of various bits of wire, guitar string, styrene tubing and some small greeblies - the cockpit looks out of this world. The Y-Wing was a two seater at first but the Rebel engineers removed the second seat to add a Hyperdrive unit . 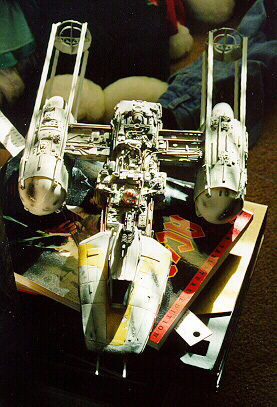 I used the engine details of the smaller X-Wing and a styrene box detailed with hoses and pipes to simulate the Hyperdrive unit behind the seat. On the top of the cockpit I added some hanging hoses (exhaust manifolds from a Ford pick-up kit) and styrene box details to simulate the the engineers cramming in the new Hyperdrive unit. Last but not least, I scribed all the panel lines on the front section, again using my blueprints as a guide. STEP 7 PAINTING AND FINAL DETAILING. I masked off the cockpit and gave the ship a overall coat of primer. This really highlights imperfections, crooked parts, misalignments and so forth. When satisfied I used Testors spray Gull Gray for the base coat of the body and Standard White for the front sections. I like to spray my ships in pristine condition first and then weather them. Once the paint dried I added all the remaining tubing and pipes (I painted them prior to attaching to the model). I used a candle flame to heat and bend the tubing to match my resource photos. These tubes were painted Gray and detailed with Rust. Y-Wings were heavily used and I wanted my kit to show that. Several of the plates on the front section were masked and reshot using a darker color as well as primer to simulate a replacement part. I tried to simulate clean panels as well as dirty ones (I'm not sure if the photos shows but there is even tiny greasy hand prints around some of the access panels). When the detail painting was done I used fine grit sand paper and worked over the front section lightly to give a worn and weathered appearance (this works very well kind of looks like oxidation of the paint has occurred). I used a hobby knife to cut in the blast hits all over the ship (note: don't overdo this - too much 'battle damage' and the ship wouldn't fly!!) I then mixed some gray and Flat Back and began giving the entire ship wear and tear - using every technique you can think of with an airbrush ( splatter, misting, hardlining, masking, and reverse masking). I hit the 'blast damage' with heavy carbon and painted the inside of the hit silver. This shows the ship's metal skin and how severe the heat was that caused the metal to melt and fuse together. I detailed and painted the cockpit as you would any modern-day military aircraft. After freeze-framing through ANH to see what colors they used, I painted the cockpit mostly darks (black, dark grey, silver, dark green so forth). Steve's next projects include a TIE BOMBER, 48cm Tall fully articulated AT-AT and a 32" Falcon (with the gracious help of Tim Ketzer who built a beautiful 32" falcon of his own). Text and images copyright © 1998 by Steve Neisen. All rights reserved.